← The Christian Social Economics of Exclusion and Vilification: The Family of God, an alternative approach. How do we to handle and understand failure in ministry? This is me standing in front of the 511 ministry house. Was all the effort I put into my ministry there a failure or not? The question, “How do we handle and understand failure in ministry?” has been on my mind for some time. In my Pihop/SSM internship we are currently reading God’s Generals by Roberts Liardon. It tells the story of numerous revivalists who did amazing things. However, all of them are marked by serious scandal and failure. If we want to learn from those who have gone before us in the past we have to admit that we make mistakes, define what they are and root them out in our own lives. We cannot white-wash failure and call it success if we are going to grow. This question came up again because I went home to Modesto for the holidays. This has naturally brought many old friends, good memories but also a number of issues and questions. One of these issues is the fact that some time I have felt that my short-lived ministry in Modesto was a failure. From the close of 2008 to the close of 2009 I started my own ministry and was technically a local missionary with City Ministry Network. I poured myself into the Celebrate Recovery ministry of my local church, the young adult congregation of my church, a Youth for Christ ministry, and a house in West Modesto that I was attempting to shape into a discipleship home for future urban Christian leaders. Something similar to the Pink House in Fresno. Money barely came in and truth be told I was dependent on my family and my own savings to make it through. I did not have enough money to both eat out with people and buy groceries so I choose to eat out of the food pantry of my church so that I could get food with people that I was discipling, mentoring, or meeting with. I ended up spending $14,000 dollars I had saved up when I worked at Costco to pay for my rent and medical insurance. I was essentially paying to volunteer. I eventually felt called by God to go to Fuller and to pursue my relationship with my Ex so I wrapped things up in Modesto and left rather abruptly at the end of 2009. Given what I can see about the fruits of my labor and the impact of what I did I am fairly certain I was wasting my time, my money and my life. The young adult community I poured into has not fared well. During my ministry time I did receive a prophetic word that the community would scatter (right back to the churches they had scattered from to be part of our community) over major or even minor issues in our community. This happened. In addition, just about everyone who was in leadership with me in the young adult community is either no longer in leadership, no longer part of that church, or no longer a Christian. I have also learned things about the Celebrate Recovery community I loved so much and was homesick for when I left for Pasadena that have tainted my memory of it. At the end of the day it was still very much part of the Christian religious system and all that that means. Some of my friends have been shunned by this grace-based community because of their divergent political views. Apparently God loves you even if you are a broken recovering addict, but God does not love you if you are not Republican. What has happened with the ministry house is probably the most painful thing for me. I lived in this house and have many great memories there. Because the house was so old and poorly insulated most of the time I was there I spent nights in bitter cold and summers in sweltering heat. I painted walls and did whatever renovations I could with my own hand with donated supplies. I led my small group there. I had kids from the area come over on a routine basis. I worked out with teens I was mentoring downstairs. I tutored teens there. I had leadership meetings with my mentor and other young ministers in the early hours of the morning. This was the house where I received the first prophetic word. In many ways this house became representative of my efforts during this time in my life. But since that time, no program ever developed. 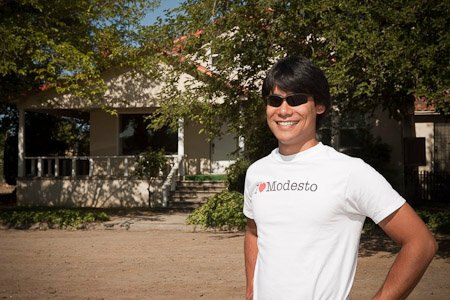 No new Christian leaders came to live in West Modesto, and the house itself is being sold off. …in the Kingdom of God sometimes failure looks like success. You can’t judge your ministry and your fruit by worldly standards of numbers, finances, and what is externally obvious. …I should not take the apparent failures of the things I was involved in personally. As Gamliel said, if God was in it, nothing could have stopped it. So either God was not in those things, or it was God’s will that things played out as they did. …it was a season in your life. I learned and grew a lot in a low stakes environment that could fall away and not do that much damage. It was better to make these mistakes in this environment than when I was leading something bigger. …I will never know the full impact my ministry had on other people because I have limited vision. I have considered these and other options, and have heard friends say similar things to me when I have aired my questions. I believe they can be true and may even be true in this situation, especially the last one. But, I am well aware that all of these could just be a way to white-wash my failures. One can use these same rationalizations and others to make any fruitless endeavor appear to be fruitful. How many failures have been mistakenly labeled as success by these rationalizations? I do not think ministry is all about numbers (regarding money, signs and wonders, fruit, conversions, etc.) but shouldn’t we expect a good tree to bear fruit of some kind? I have brought it up before but I fear that too often Christians explain away failure instead of accepting it and growing from it. I think we do need to admit our failures in ministry and grow from them. I personally do not want to wait until I am dead and someone writes a book about me to see my failures and learn from them. …had a relationship with God before I did ministry. …had raised adequate financial support or continued at Costco during that season instead of just “trusting God” with my finances. …had spent more time in prayer and interceding for others. …had wasted less of my time during that season. How do you handle and understand failure in ministry? When do you admit it and why? How do you handle the tension that sometimes success in the Kingdom of God looks like failure to the world and at the same time sometimes success in the Kingdom of God does look like success? This entry was posted in Personal Commentary and tagged Bible, Christianity, Church, failure in ministry, God's Generals, Jesus, ministry failure, missionary work, Para-Church, white-washing failure. Bookmark the permalink. 1 Response to How do we to handle and understand failure in ministry? Have you ever read or gone through any of Bobby Clinton’s stuff? I think taking “Formation of Emerging Leaders” helped me be able to look at things in the past, both good and bad, as ways the Lord was developing my character as a leader. The failures of my early years in ministry are foundational steps for my development towards success of my fruitful years. Dr. Clinton’s premise is that as emerging leaders, God’s primary objective is to work in us, more than through us. This helps release me of regret, but rather learn from these situations and move ahead. As for those that might have been negatively impacted, I have to trust in God’s sovereign nature (and maybe even a little Calvinist) and know that He is faithful to pursue His people to the end with His love, even if humans mess it up.